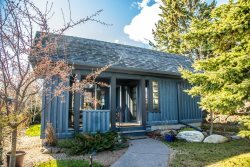 Enjoy this beautifully crafted home located less than 1 mile from Lutsen Mountains. Lutsen Log Lodge 14 is a 3 bedroom, 2 bathroom log cabin home in Lutsen, MN.The living room opens into the kitchen and dining room area. Sit out on the large front deck in the summer months. Plenty of views of the beautiful Superior National Forest. This home boasts vaulted ceilings and an open living space. The stone surround gas fireplace is the focal point of the living room. The living room opens into the kitchen and dining room area. The television is hidden within the entertainment center. Enjoy a home cooked dinner at the dining room table - plenty of room for everyone. The kitchen is well-equipped and perfect for preparing meals during your stay. Dishwasher included - no need to wash dishes on your vacation Head on up to the private master bedroom in the loft. Walk into the master bedroom in the loft. The bedroom boasts a queen bed and plenty of windows for natural light. Curl up in the queen bed after a long day exploring the North Shore. Did we mention the master bedroom features a 2-person jetted tub Because it does Also connected to the master bedroom is a private bath with a walk-in shower. Plenty of room to get ready in the morning at the master bathroom vanity. The first guest bedroom has a double bed. Plenty of room to unpack and relax. The second guest bedroom has a twin over full bunk bed. The main floor guest bathroom has a shower/tub walk-in. Step out of the living area and enjoy the open back deck. The back area also features an enclosed portion of the deck- perfect for summer nights when the mosquitoes are out in force. View of the home as you approach it from the road. The back of the home in the spring season - surrounded by trees in the Superior National Forest. Your search for a North Woods log cabin retreat ends right here! The Lutsen Log Lodges are a series of custom built log lodge homes located in the heart of Lutsen on Ski Hill Road. This log cabin boasts an open living space with vaulted ceilings and a beautiful stone-surround gas fireplace. Nestled amongst trees in a safe and quiet neighborhood, you are also just half a mile from all of the action on Lutsen Mountains. In this home you will find a second level private master bedroom with queen bed and 2-person jetted tub. There is also a private bathroom attached. The main level has two bedrooms one with a full bed and the other with bunk beds. The guest bedrooms share a full bathroom. The home can comfortably accommodate up to six guests, making it the perfect retreat for a family or group of friends wanting to come up to the North Shore to ski in the winter or explore the miles of nearby hiking trails in the summer. You can't get much more centrally located than this in Lutsen! Located just off Ski Hill Road, you are half a mile away from the ski resort and summer recreation center including the Alpine Slide and sight-seeing Gondola. Papa Charlie's and Moguls Restaurants are near the mountain for full menu dining. Or head down toward Highway 61 and grab a bite to eat at the Lakeside Dining Room at Lutsen Resort or Lockport, both located within a mile. If adventure is what you seek, you've found it! The central location puts you right in the heart of hundreds of miles of hiking and mountain biking trails that weave back into the Superior National Forest. Up for a round of golf? Superior National Golf Course at Lutsen is right across the street! In the winter you can enjoy the groomed fat bike trails at Superior National, as well. Plus you are just 10-20 miles away from many other dining and adventure options in Tofte, Lutsen, and Grand Marais. Make Log Lodge #14 your home base for your next North Shore vacation, no matter the season! We have rented a number of times and always have had a good experience. Very nice cabin with an up north feel. All aspects of the reservations process worked great. Made a call to confirm if a Keurig coffee maker was in the rental. Was told no when there was. Place was clean and well kept. Location was great. Very central to everything on the north shore. Beth, in the main office was very friendly and helpful. She also gave us a late checkout, so we could relax in the morning and not have to hurry out. Great location to ski hill. Very clean and comfortable home. We love the decor and especially love the fireplace. It was too cold to go outside on the deck but would love to return in the summer and enjoy the screened in Deck. We also made use of the DVD player and the games that were stacked in the home. Lots of hot water, which was very appreciated after a cold day of skiing. Also right next door to North Shore Winery. A very short distance away! The property was in excellent condition. We loved the location and the amenities - it was perfect for our group of six. Would definitely rent again. Such a beautiful cabin! The location was perfect... Our daughter got married at Lutsen at the time of our stay so we had many fun, happy, family celebrations while we were there. It was the perfect setting for making great family memories. Thank you for making such a beautiful place so affordable. Seriously. It was amazing. The location is perfect, a few minutes walking from the Lake Superior. The cabin was beautiful and extremely clean. We had everything we needed there. No complaints. I suggest having some fans available or listing it as something guests may want to pack (for summer months). Log Lodge 14 was beautiful and perfect! We honestly wouldn't change a single thing! Very nice. Lovely place. Superbly decorated. Ample room. great location. Perhaps some arrangements to control the mosquitoes. Some of the covering for the patio was broken allowing access to the insects to come in. Very nice cabin. Had all the kitchen supplies we needed. Gas grill did not work but when we contacted the rental office they brought us a brand new webber grill to use. The home was perfect. The location was fantastic and close to the ski resort. There is nothing I disliked about the experience. The layout of the house was great, and the amenities were as well. Very nice! Absolutely loved the cabin. It was well stocked with amenities and was very comfortable. Loved the master suite in the loft! a WONDERFUL EXPERIENCE. JUST RIGHT FOR A RELAXED VACATION. IT WOULD BE HELPFUL TO HAVE LAMPS FOR READING.